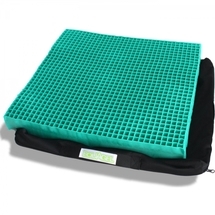 The EquaGel Adjustable Protector Cushion is an alternative cushion to any other on the market. Its unique gel design offers maximum comfort by distributing weight evenly when seated. It has been designed to effectively lower and minimize the pressure on the buttocks reducing the chances of pressure sores. It is a great product for people who have very limited movement while seated and are prone to pressure ulcers. 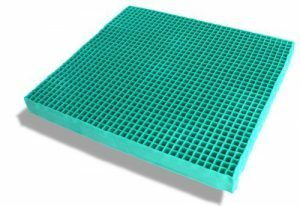 This pressure cushion is made by two layers of dry-polymer gel; the top layer comprises a thin wall of gel, while the lower is made from a thicker gel layer, designed to maintain posture support. Gel Pressure Cushion is 2.5" in Height. Adjustable Extra Gel Component. The EquaGel Adjustable Protector Cushion has a waterproof cover and velcro strip on the bottom for wheelchair users. The safe user load is determined by bottoming out.